Stand out and be different with your own customized sneakers. 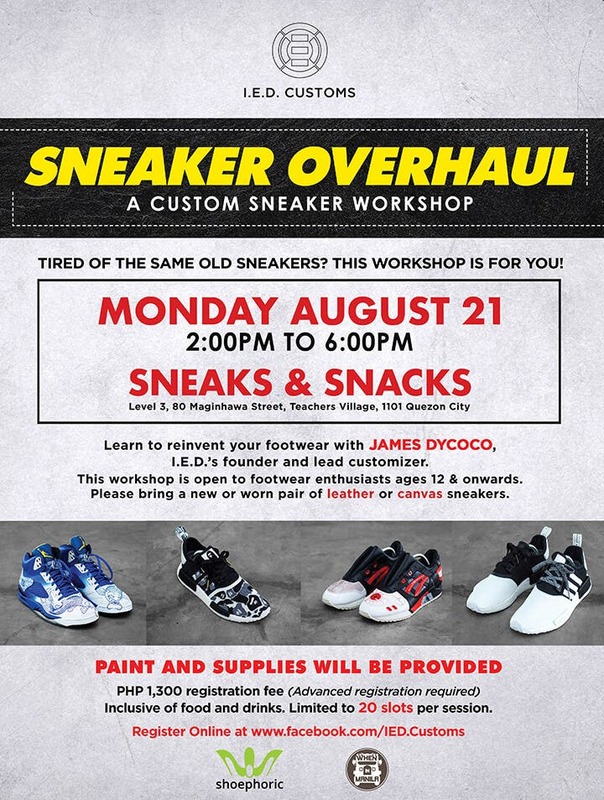 Learn from I.E.D.’s founder and lead artist, James Dycoco, and take part in Sneaker Overhaul, Philippine’s first ever custom sneaker workshop. Sneaker Overhaul takes place on August 21 in Sneaks & Snacks, a sneaker themed burger bar located at Level 3 80 Maginhawa Street, Teachers Village, Quezon City. The workshop runs from 2:00 PM to 6:00 PM, covering the crucial basics in sneaker customization as well as advanced painting techniques. Registration fee is PhP1,300 inclusive of food and drinks. Paint and supplies are provided and participants will have to provide a new or worn pair of leather or canvas sneakers. Back in 2014, I.E.D.’s artist only had a handful of Youtube tutorials as a guide to sneaker customization. Some of those videos often leave out important steps and details opting only to focus on achieving a particular look while neglecting to emphasize on paint usage and durability. Through Sneaker Overhaul, I.E.D. aims to cultivate the local custom sneaker scene by providing sneaker enthusiasts and aspiring customizers a more comprehensive guide to this craft. Innovated Elemental Designs, more commonly known as I.E.D. Customs, was founded in November 2014 by James John P. Dycoco, a student in Singapore’s Nanyang Academy of Fine Arts. I.E.D.’s designs are inspired by the artist’s interest in fine art, film, and anime but are also known to create “what ifs.” I.E.D.’s custom sneakers have earned recognition from international sneaker publications such as Modern Notoriety and Kicks on Fire; and have reached sneakerheads as far as USA, Dubai and Hong Kong. I.E.D. has also been featured on FHM.com and Shoephoric. To learn more please visit IED.Customs or call us at +639952385764. Here’s What Went Down at the Bangin’ NURock Years Concert!